South African Shipyards (SAS) has been given the green light to commence construction of a new, ice-strengthened hydrographic research vessel for the South African Navy (SAN). Upon completion, this newbuild will replace the SAN’s existing hydrographic survey vessel, the 79.3m x 15m, 1971-built SAS Protea. 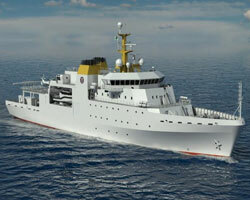 The forthcoming vessel has been based on naval architect Vard Marine’s VARD 9 105 class (a.k.a the Echo class) as exemplified by the 90.6m UK Royal Navy hydrographic research ships HMS Echo and HMS Enterprise, which were built in 2002 by UK-based Appledore Shipbuilders. However, the newbuild will feature a length of 95m and accommodate up to 120 persons, including crew members and scientists. She will be built in compliance with the International Association of Classification Societies’ Polar Class (PC) 7 rules. SAS will reportedly furnish the vessel with approximately 12.24MW of diesel-electric power. The Durban-based yard also estimates that the completed vessel will feature a top speed of 18knots and a range of 10,000nm with 44 days endurance.